Foo Fighters are gearing up for a performance on DIRECTV’s Super Saturday Night on February 2 at Atlanta’s Atlantic Station. The Foos will be joined by special guest Run The Jewels – with the show coming a day before Super Bowl LIII, which will take place at the city’s Mercedes-Benz Stadium. 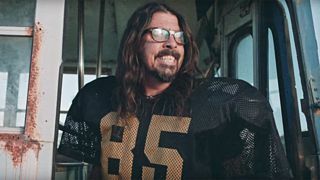 To get music and sports fans excited about the event, the Foos have starred in a spoof, lo-fi video – written and directed by Dave Grohl – which shows them take a punt at a career with the San Fernando Jackalopes. Of course, as you might expect, nothing goes well for the hapless squad, with the video showing their big shot at glory go awry in a variety of amusing ways. Larry Butz (Dave Grohl) likes his alcohol a little too much, Helmuut Pyle (Pat Smear) is a bit dazed after years of being roughed up as a defensive back, Jake Schenker (Chris Shiflett) has clearly taken his fair share of 'performing enhancing drugs', quarterback Bret Rogers (Taylor Hawkins) hasn’t thrown a touchdown all season – and Bertrand Hitchens (Nate Mendel) suffers a horrendous, season-ending injury during practice. The video also stars Curt Menefee, Terry Bradshaw and Michael Strahan and can be watched below. Both Foo Fighters and Run The Jewels sets on February 2 will be broadcast live via Twitter, while the performances will also be available via Audience Network and Direct TV Now.